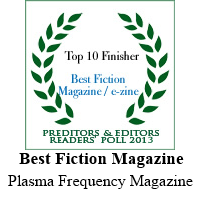 Plasma Frequency (plasmafrequencymag.com) is a bi-monthly publication that first started is August 2012. We are starting our third year of publication and we have decided to take some big steps this year. First, we are putting all our stories online, free to read. Or if you prefer to read a print magazine, or read on your eReader, we have a print and digital edition. Each of our issues has 10 short stories, ranging in length from 7,000 words on down to just 100 words and everything in between. We publish both brand new authors and well-known names. We are so happy by the amazing stories we get each issue, and we really wish we could pay our authors more that just the 1 cent per word we offer now. And that is where you come in. If we raised $300 a month, we could raise our author pay rates to 2 cents. If we reached $600 a month we could raise our author pay rates to 4 cents per word. That seems like a lot of money, but if everyone just put a little bit aside to help us out, we could reach that number easy. Besides helping a great publication get even better stories (which you get to read for free), there are a few perks to helping us out too. Remember, we aren't charging for our services, we just need your help. A higher author pay rate means a bigger selection of stories for us to choose from. Right now everyone who donates through Patreon gets free access to our electronic issues for eReaders. Level 1: Those who donate at this level for ten months will be listed in our issues on the Donor's Thank You Page as a Ham Radio Operator. Best of all if you stick with us you can rise up on the list to the donor classifications. In 20 months you can be Local Broadcaster and in 30 months you can be a National Broadcaster. In 50 months you can be a Worldwide Broadcaster. And if you stay with us for 100 months or more, you can become a Regulator, and rule all those beneath you! Those who donate at this level for two months or more will receive the next issue free for eReader. After two months they will continue to receive free eReader copies of new issues for every two months they remain at this donor level. Level 2: Those who donate at this level for 5 months will be listed in our issues on the Donor's Thank You Page as a Ham Radio Operator. Best of all if you stick with us you can rise up on the list to the donor classifications. In 10 months you can be Local Broadcaster and in 15 months you can be a National Broadcaster. In 25 months you can be a Worldwide Broadcaster. And if you stay with us for 50 months or more, you can become a Regulator, and rule all those beneath you! Level 3: Those who donate at this level for 2 months will be listed in our issues on the Donor's Thank You Page as a Ham Radio Operator. Best of all if you stick with us you can rise up on the list to the donor classifications. In 4 months you can be Local Broadcaster and in 6 months you can be a National Broadcaster. In 10 months you can be a Worldwide Broadcaster. And if you stay with us for 20 months or more, you can become a Regulator, and rule all those beneath you! Those who donate at this level for 1 months will be listed in our issues on the Donor's Thank You Page as a Ham Radio Operator. Best of all if you stick with us you can rise up on the list to the donor classifications. In 2 months you can be Local Broadcaster and in 3 months you can be a National Broadcaster. In 5 months you can be a Worldwide Broadcaster. And if you stay with us for 10 months or more, you can become a Regulator, and rule all those beneath you! Those who donate at this level for two months or more will receive the next issue free in PRINT. After two months they will continue to receive free print copies of new issues for every two months they remain at this donor level. Sorry International Donors, we can not ship internationally at this time. If we remain at $300 for two consecutive months we will permanently raise author pay rates to 2 cents per word. This means higher quality fiction, free for you to read on our website.